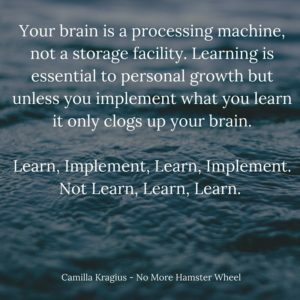 Have you ever wondered why your brain feels like mush even if you’re listening to or reading good material such as personal development books, podcasts and other educational input? I mean, after all isn’t that the kind of material you want to feed your brain vs. the crap on TV? Although the brain isn’t a muscle it sort of works like one. Our brain use more energy than any other part of our body, about 20% of all your energy intake, and the more it works the more energy it uses. Just like a muscle it gets tired and needs to recharge. If you’re putting your brain through a marathon each day you need to treat it accordingly. Your brain, since it use so much energy, is also influenced by your nutrition, just like the rest of your body. Poor nutrition leads to poor brain performance. If you remember from biology, food gets converted to glucose, which is the energy source for the body. Now, not all glucose is good glucose. Your brain doesn’t exactly rock n’ roll if you live on junk food, sugar, caffeine and soda. There’s very little substance in that kind of food. Your brain wants good, healthy nutrition and fluids. 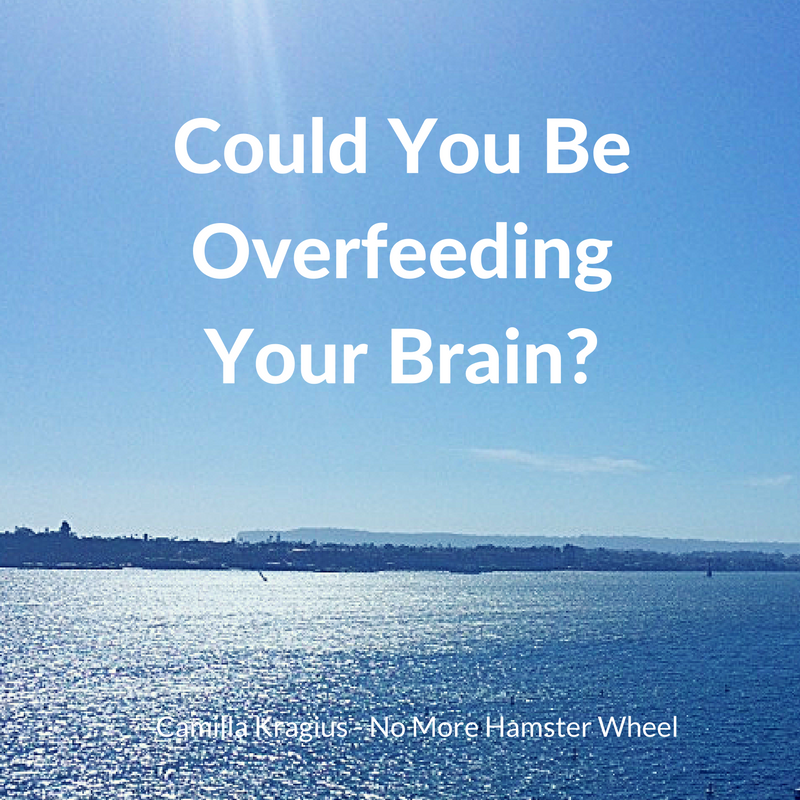 Can You Overfeed Your Brain Even With Good Material? I honor your commitment to feeding your brain good material and don’t stop doing that. Just understand that as with any kind of input, your brain still needs to think about what to do with that. That’s why, regardless of the material, if you feed your brain too much to process, it still gets tired. As you’re now in this space of personal growth it’s easy to want to listen to all the podcasts, read all the books, do all the things. I totally get that. There’s so much to learn and now you want to know it all, preferably yesterday. Your brain needs time to recharge. 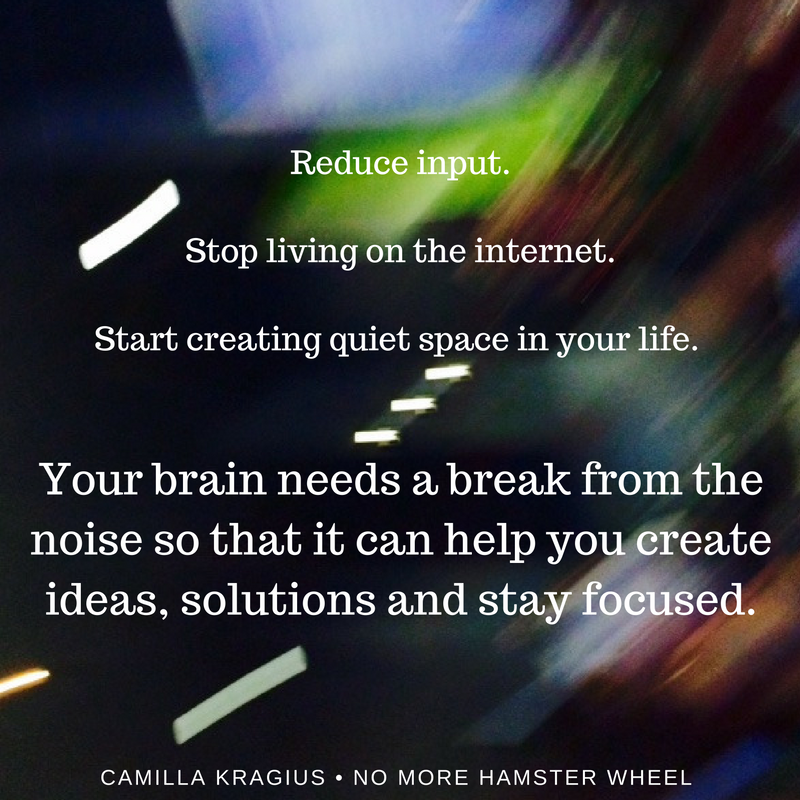 The way to do that is to reduce as much other input as possible, especially the kind of input that isn’t helping you to move forward in life, plus allow your brain some time off. Walks in nature, days off the computer, lots of breaks throughout the day, meditation, sleep, time with friends, and other non-reading/listening/studying activities. Also, remember to implement what you learn so you follow the “Learn, Implement, Learn, Implement” strategy. Feeding your brain without putting it to use is a waste of time and energy. 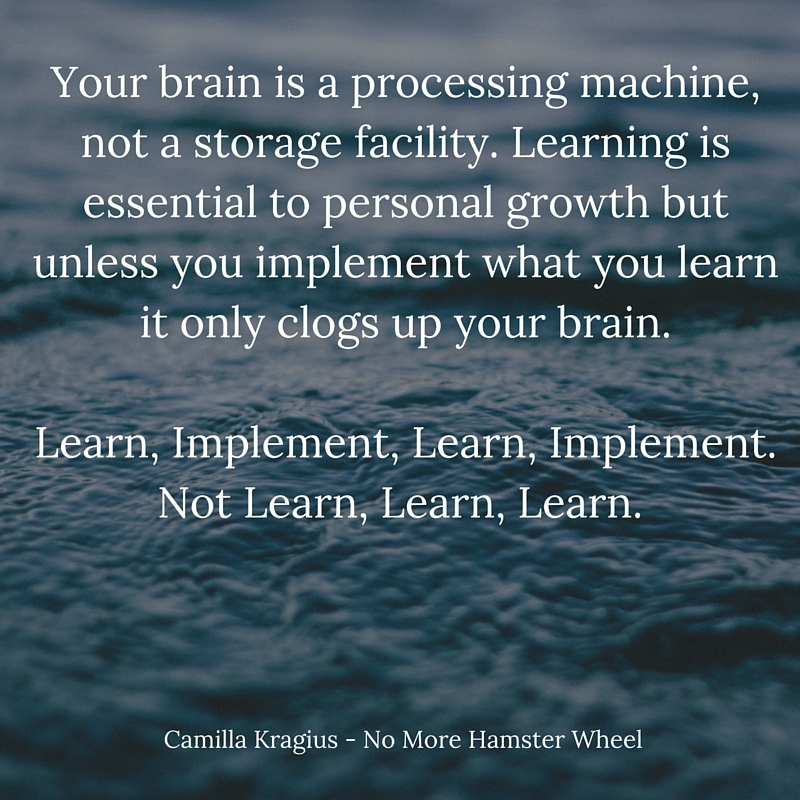 Yes, I know that means slowing down learning all this great material, but you’ll retain it better by having a fresh brain, not a tired one. Just think of how your muscles feel after a hard workout. After a few days of hard workouts your body isn’t as responsive simply because it hasn’t had time to recharge. So as you work on your personal growth, remember it still comes down to balance. Because sometimes too much good can have it’s consequences. Even when you have the best of intentions. If you felt this post was of value to you please share with others so they too can learn how to stop spinning and start living. I appreciate you! Now go and move your life forward but do it in balance. Think long-term. You can do it! If you missed the first 4 habits, click HERE. Have you ever wondered why you feel kind of tired after surfing the newsfeed or watching TV despite that you’re not really doing anything? After all, shouldn’t that rejuvenate you? Your brain receives over 11 million inputs per second. It can only process about 40 of them. Which means, your brain has to constantly use energy making a decision on what to actually process and pass on to your conscious brain. The rest gets filed away in your subconscious brain (which is why limiting input that’s negative is so crucial). The amount of input we are exposed to is increasing. Social media, streaming videos, games, non-stop 24/7/365 access to pretty much anything you want to learn, watch or read. Shortly speaking, people today are exhausted and overwhelmed much due to the insane amount of input we are exposing our brain to. Your brain is dealing with something called decision-fatigue. Instead of kicking up our feet up and day-dreaming in silence we spend hours surfing the internet, watching TV and video’s, listening to music, podcasts, browsing the newsfeed of social media and the list goes on. We’re always doing something! Even when we’re taking a “break” to relax. Because not doing something is seen as lazy. At the same time your brain has become addicted to dopamine hits putting you in a “addicted to more input” situation making you spin in a cycle of craving more input. You can’t be creative, focused and gain balance in your life if you are always doing something. Your brain needs quiet space so that it can provide you with answers, ideas, creative solutions and much more. That’s why walks in nature, going camping and just being quiet in silence day-dreaming under a tree in a park and practicing meditation are essential to life. You all know how rejuvenating it is taking a break doing nothing and how beneficial it is. 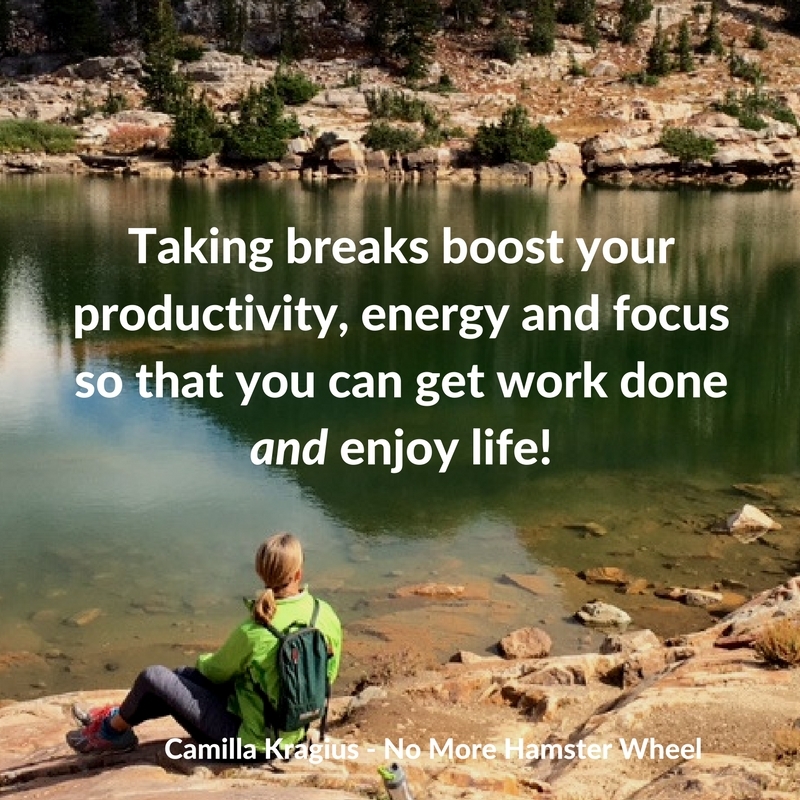 If you’re struggling with the feeling that doing nothing is equal to being lazy think of ‘do nothing’ breaks as a productivity boosters. Think of them as essential to your well-being. 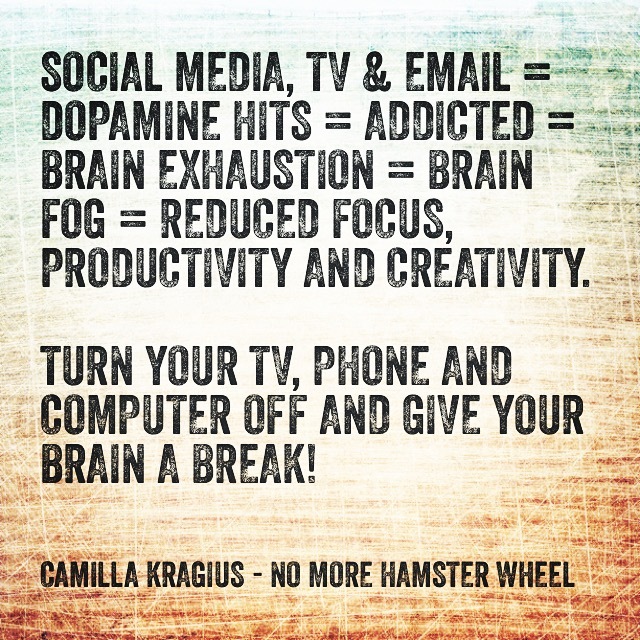 Re-train your brain’s addiction to dopamine hits. Changing a habit is not done overnight. It takes time. It’s a process but I hope by understanding a bit more on how your brain reacts to input you become more aware of how it affects you and your life. When we become aware we can choose to change things. We’ve all heard the say that the way you start your morning sets the tone for the day. Which is true if you really think of it. If you have a calm morning when you don’t feel rushed you feel differently than if you rush around. When you’re stressed the entire day seems to work against you, while if you’re calm things go smoother. It’s time for habit no. 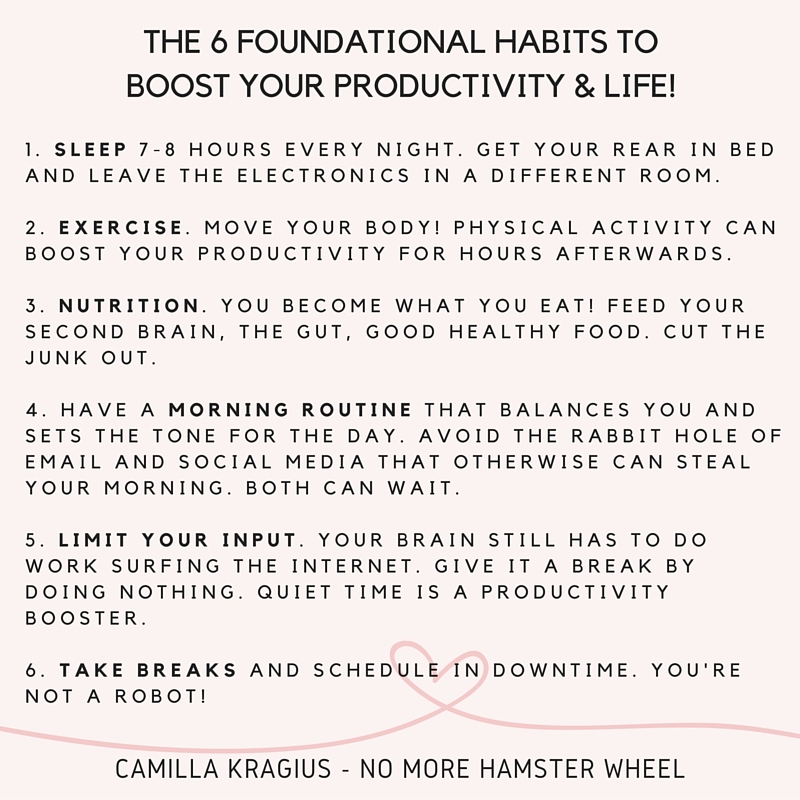 4 in the series of The 6 Foundational Habits for Productivity. If you missed habit 1 through 3 go HERE. If you want a calmer morning I have a very simple solution for you. NO checking email, NO checking social media, NO checking anything on the phone (or the computer) at all for the first hour. According to a 2013 study done by IDC Research 80% of people check their cell phone first thing in the morning. I wouldn’t be surprised if that number is even higher now. When you check your phone first thing in the morning, you end up not only wasting precious time you could use for other things, but you also end up on other people’s agenda. 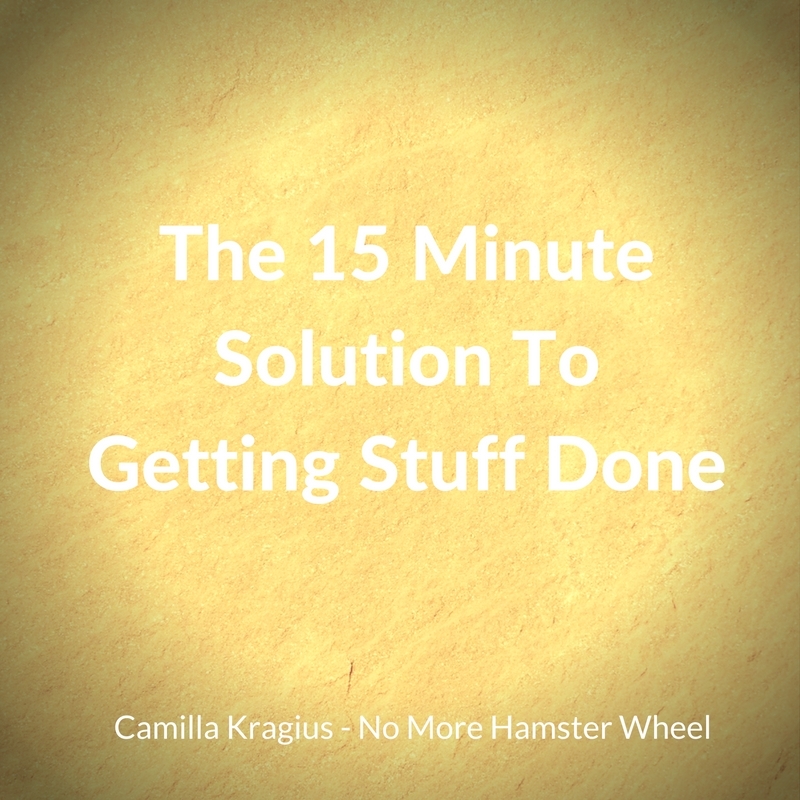 You may think it’s not affecting you but now you’re down the rabbit hole of busy but not productive. Your mind is focused on whatever input you just exposed it to. That also includes other media such as the news. Starting your day with the news isn’t exactly uplifting! Studies show people check their phone about every 6 minutes during waking hours. If that’s you, then your brain has become addicted to your phone, just like someone is addicted to drugs. Your brain is craving its dopamine hits and if it doesn’t get its dopamine (aka. checking the phone) you may feel stressed. Re-train your brain by becoming “addicted” to a calm and balancing morning instead. Meditation is a great habit to incorporate into your morning routine and throughout the day too. Meditation alone can boost your focus, productivity, memory and energy. It also helps with stress relief and can have a very calming effect. Meditation is a practice so if you’re new to meditation remember it’s about progress, not perfection. There are two great apps I recommend called Calm and Headspace that have guided meditations that can help you get started. Gratitude is the foundation for happiness and starting your morning feeling grateful definitely sets a positive tone for the day. Gratitude helps you to focus on the positive instead of the negative. Positive people handle stressful situations and detours in life better so when that person cuts you off in traffic it’s not a big deal. Remember – whatever you focus on expands! When I started this journey I wanted to know how highly successful people spend their time. They seemed to get so much done and I wanted to know their secrets. What I learned is that they protect their mornings and focus on doing things that nurture them. Besides getting up early, often around 5 a.m., some practiced meditation, some would exercise and others had a routine of journaling and reading. Then they would dive into work. I remembered a time when I used to get up early to read first thing in the morning and how peaceful that was, so I decided to create my own morning routine to see what would happen. I tested different things but finally set on a routine of meditation, gratitude and journaling, positive affirmations and then reading. I sometimes do visualization after meditating. I instantly noticed a difference in how calm and more prepared I was for the day. I was hooked. Years later I read a book called the Miracle Morning by Hal Elrod that explained why I felt such a big difference. Implementing the habits from the book into your morning is life-changing. Hal set out to test to see what would happen if you did ALL of the habits that highly successful people do in the mornings instead of just a few of them. With that he created the S.A.V.E.R.S. system. I highly recommend the book. Try it out! 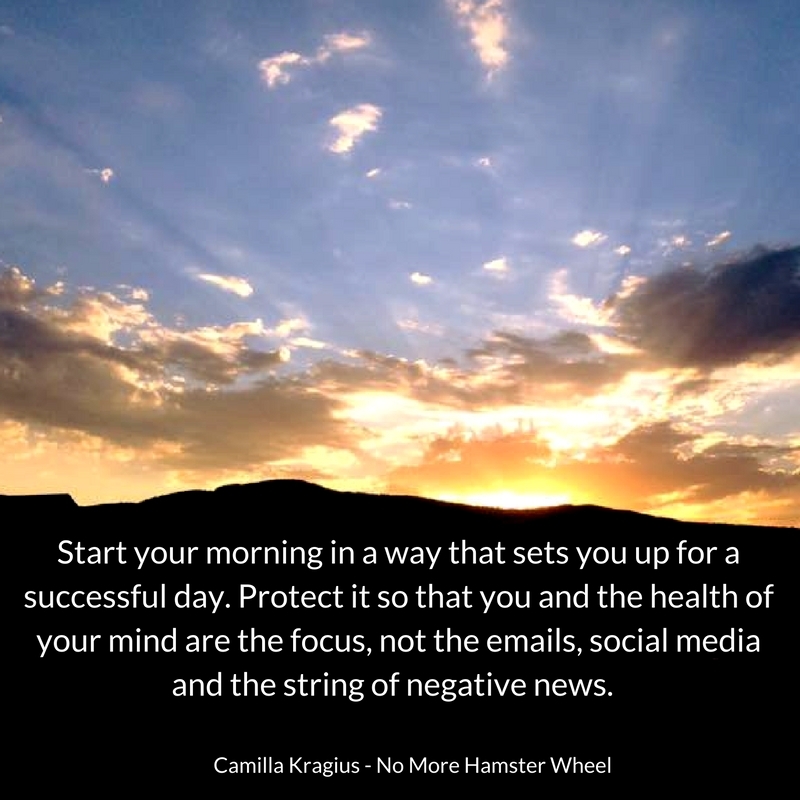 It can be challenging in the beginning to switch over to a good morning routine so start with one thing, then add another until you’ve created your ideal morning that sets the foundation for the kind of day you want to have. You can either live your life in a proactive mode or a reactive mode. Successful people create their day into what they want it to be instead of letting the day rule them. You can too! *The link goes to Amazon and should you purchase the book through that link I may receive a small commission. I appreciate your support. As always I ONLY recommend books and products I’ve read and use.